This is a LOLspeak translation dictionary consisting of a core YAML dictionary file with translations for individual words. It is a complete dictionary with no regular expressions or heuristics. While it is more of a pain to maintain this way, it also makes it more portable to other contexts where regular expressions are not available (like the Apple dictionary). 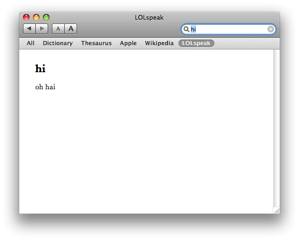 This dictionary has been spot-checked against Matt Sephton’s speaklolcat.com, an online lolcat translator. So many thanks to Matt for creating speaklolcat.com! "Hi cat".to_lolspeak -> "oh hai kitteh"
Or download the gem and source code from RubyForge. The source code is released under the MIT license.